Long before boutique bass amps like Markbass, Genz-Benz and Ashdown appeared on the scene, the Ampeg SVT tube heads held down the bottom end in the backline at concerts. Ampeg branched out into solid state technology some time ago, and the company has released two new heads the popular SVT-PRO Series, the SVT-7PRO and the SVT-8PRO , one of which has enough power to bring down small buildings or drive groundhogs out of their burrows, fer sure. The SVT-7PRO pumps out a full kilowatt (that's 1,000 watts, if you're not up on your electrical terminology) yet weighs only 15 pounds. The head offers professional features, including a flexible 5-position mid control, a remote switching FX loop and an onboard variable compressor. The tube preamp usesa premium JJ 12AX7 that feeds Class-D power section. It's a perfect match for the all-new PRO NEO Series or Heritage Series enclosures. If you think 1,000 watts is a lot of power, you'll be impressed to hear that the SVT-8PRO delivers up to 2500W of RMS power in a the same compact, lightweight, two-rack-space design, making it the highest output head ever created by Ampeg. 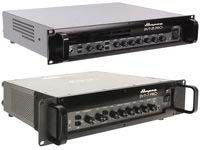 The Ampeg SVT-7PRO is now available and has a U.S. MSRP of $1119.99. The SVT-8PRO has estimated availability in the first quarter of 2010 and will have a U.S. MSRP of $3359.99.